3 Legged Thing has revealed details of a brand new L-Bracket - called Ellie. After the success of its predecessor, the QR11-L, the 3LT Ellie is designed to fit a large range of camera models, both DSLR and mirrorless types, from multiple manufacturers. With Arca-Swiss attachment compatibility, the Ellie base can be precisely adjusted, using a pair of mount slots, to allow ideal positioning for the user's chosen camera model. Unlike other models of L-bracket, the length of the base itself can be altered, so that it can be perfectly aligned with the base plate of the camera. This makes the setup more balanced and less susceptible to snags and knocks, as the photographer handles the controls of the camera, once it is mounted on the bracket. Handily, the trailing edge of the base is sloped, overcoming once of the biggest inconveniences of using an L-bracket. This angle allows easier access to camera controls and the rear LCD, which is especially useful with the prominence of touchscreen-fitted cameras today. There is an opening on the vertical arm of the bracket to enable users to attach accessories using L-shaped cable pins to the camera. This opening itself can be repositioned to taste, by moving the vertical arm. This vertical part can be adjusted using the supplied Allen key, which may be used to adjust the stainless steel rods utilised in the attachment assembly. This vertical arm features four ¼”-20 threads - two at each end, which permit the attachment of further accessories, such as microphones, LED panels and other mounting arms etc. Interestingly, once the vertical component has been removed, the base plate can be used as a standalone quick release plate, increasing the versatility of the bracket. There is also a strap attachment point on the base, to allow a camera strap to be left on the camera at all times. 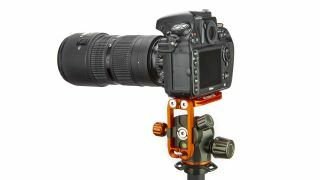 A further feature is the ability to invert the vertical part to create a rocker head like setup when used on a tripod with the head in the 90° position. 3 Legged Thing recently introduced the Zelda - an L-bracket custom-made to fit Nikon Z6 and Nikon Z7 cameras. The Ellie is constructed from the same grade of magnesium alloy as that's used in the aerospace industry - which should be a good indicator of it's strength and longevity. The bracket has currently been released in two colors, copper and metallic slate grey, both of which have an anodized finish. It will be on sale from March 2019 but is available to pre-order on the 3LT website, priced £64.99 / $69.99.